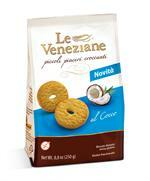 There is a tasty new arrival in the Le Veneziane selection ! 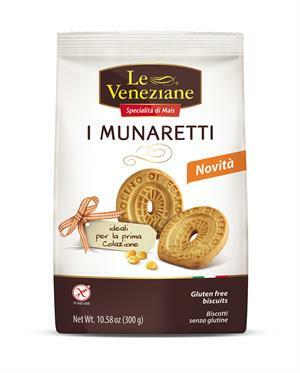 Introducing “I Munaretti”: gluten-free biscuits with an irresistible classic flavour! A classic new flavour has been added to the range of “Le Veneziane Gluten-free Biscuits”: “I Munaretti”! These traditional biscuits are made with butter and maize flour. They are perfect for dunking in milk, coffee or tea every morning. “Le Veneziane” biscuits are the perfect fit for every occasion, from breakfast to your afternoon tea break. Only the finest ingredients are used, as guaranteed by Molino di Ferro. After all, you deserve the very best! agents: ammonium carbonate, sodium hydrogen carbonate, diphosphate emulsifier: soya lecithin, flavours.